I remember when I was breastfeeding my baby with a milk allergy. Actually, babIES. 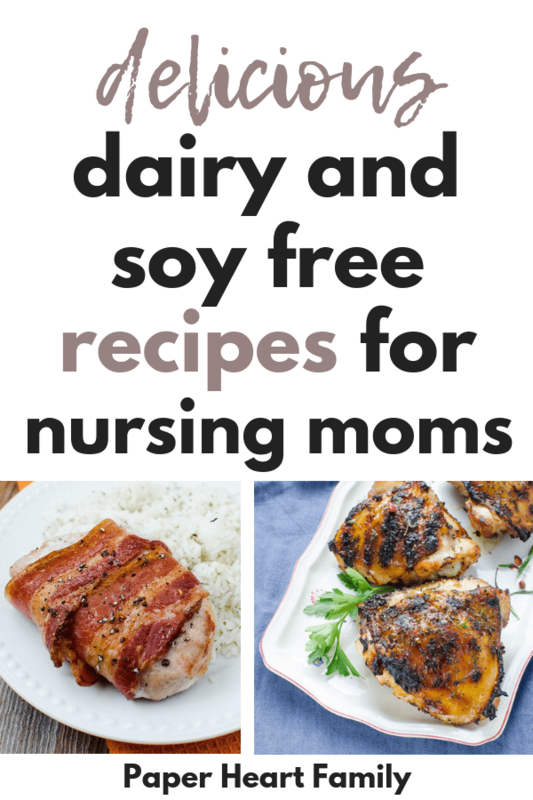 I would have LOVED to have this list of dairy and soy free dinner recipes for nursing moms. I also would have loved to have this 7-day dairy and soy free meal plan, complete with breakfast, lunch and dinner recipes for an entire week! I spent way too much time perusing Pinterest for recipes that I could actually eat, only to find recipes that included obscure ingredients. Or that were entirely too labor intensive for a new mom. My baby had MSPI, which meant that she was clingy, and gassy, and that I could do nothing that required two hands. I mean yes, I suppose I had a lot of time to spend looking up recipes on my phone while holding my baby, but I spent that time googling milk protein allergy symptoms instead. These dairy and soy free dinner recipes are easy, quick, healthy, MSPI-safe and are made with common ingredients that you likely already have in your pantry. Because when is the last time you got to the grocery store? That’s what I thought. Don’t worry. I’m gonna help you master the dairy and soy free diet for breastfeeding moms. Be sure to also read my extensive list of snacks that are dairy and soy free. If you have an instant pot, you should definitely try making this Salmon with Chili-Lime Sauce. It’s a little spicy and a little sweet, and so delicious. Also, in moderation salmon is super healthy for breastfeeding moms. Now that you’re dealing with MSPI, this is a great time to experiment with some new marinated, grilled recipes like this Grilled Chicken With Herb Dry Rub. When you are avoiding dairy and all of the comfort that comes with it, there’s nothing better than finding a safe, comforting dish like this Easy Chicken Stew With Fall Vegetables. I love salads, but sometimes my salad ideas bore me. This Vegan Charred Caesar Salad With Crispy Chickpeas is anything but boring! Sheet Pan Fajitas are the perfect recipe for a busy new mom. It’s everything in one pan (and if you line the pan you won’t even have to wash it after dinner). Do you have an air fryer? Have you ever tried to cook a whole chicken in it? I’m always intimidated by these things, but I promise this Air Fryer Whole Chicken is so easy. Potato Quinoa Corn Chowder is rich and filling, and super delicious. When you’re missing cream and all things creamy, a recipe that promises creaminess is a dream come true. This Creamy Garlic Pasta will tame your cravings for creaminess. It’s the perfect dairy and soy free side dish. This Herb Pear Roasted Tenderloin is bee-u-ti-ful. Seriously. If you’re having a dinner party, serve this. No one will even notice (or care) that you’re on a restricted diet. Apple Pork Tenderloin that you can throw in your crockpot and forget about. Until you start smelling the delicious aroma, that is. The easiest recipe ever, these Bacon-Wrapped Pork Chops seem like they’re much more labor intensive. A crowd-pleaser for sure! If you love these recipes, but want MORE, check out my Complete Guide On Breastfeeding A Baby With MSPI. It not only contains over 100 recipes, but it also includes everything you need to know about MSPI so that you can continue to breastfeed your baby for as long as you’d like. No problem, I hope you enjoy them!